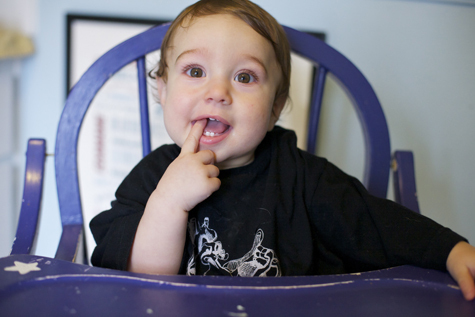 Feeding a vegan baby isn’t anything special, really. 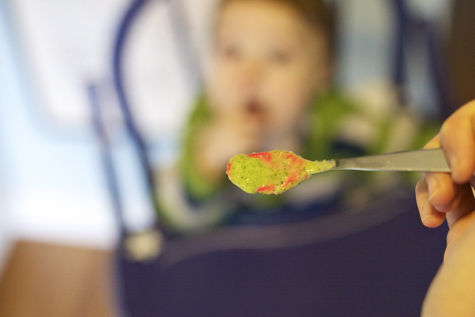 All munchkins under one are getting the bulk of their nutrition from breast milk or formula – food at this age is more about sensory exploration and ‘practice’ for down the road. And many animal foods are actually common allergens, thus withheld until later on anyway. So for now, my focus in feeding Waits is less about being vegan, and more about being a damn hippie. And feeding a hippie baby . . . well, that can get complicated! 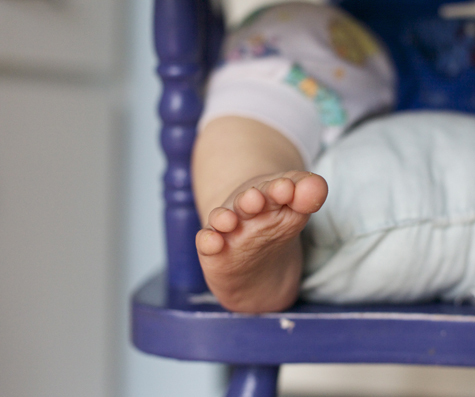 We postponed starting solids until Waits was displaying all the signs of readiness: sitting up on his own, loss of tongue-thrust reflex, and using the ‘pincer’ grasp. We decided to delay the introduction of grains and thus skipped right over rice cereal. We introduced veggies before fruits to try and avoid a ‘sweets’ bias (yeah, not so successful there). We do daily probiotics (in various forms), we soak and sprout to maximize nutrients, and for the most part everything is ‘whole’, homemade, and organic. 1) Feeding Your Vegan Infant With Confidence – great book, but the price really fluctuates! 3) Raising Vegetarian Children, which contains lots of info for vegans, too. 4) Becoming Vegan is the best all-around nutrition reference book EVER! Do you have any specific questions you’d like me to address in these coming articles? Leave them in the comments! And fellow mamas – please share your experiences as well! You know, I always thought that Waits looked like a Xerox copy of Damian, but in that photo he looks EXACTLY like you, homygod. I’m grateful for this new little series of articles! No children for me (I’ll be the cool aunt one day ;)), but I’ve been trying to research things like this for my book. You’re simply a lifesaver, Sayward! Anything by Fuhrman is my immediate go-to reference material. More on this topic (esp. other author faves) later when I have enough time to formulate a decent reply! a) we stayed away from cereals, I didn’t agree with my son’s first food being processed. b) eventually started including organic, cruelty-free chicken into his diet. It’s prepared by my mother – and sadly – he absolutely adores it. c) do our best to feed him a “rainbow” of fruits and veggies every day. Also – we live by the “dirty dozen” and “clean fifteen” lists to make sure that we do strictly organic on the dirty dozen (and we try to do organic for most other things). Great timing, Sayward! Our little guy just turned 4 months old and I am starting to research all of the new feeding recommendations. This article is JUST what I needed. The doctor’s advice I got for my 3 older kids (ages 15, 13 and 9) was so different. They used to push an intro to rice cereal at 4 months! I am glad we are waitng until our lil Dylan is showing signs of readiness. Also, baby is showing signs of teething and he needs relief NOW! How do you weigh in on Baltic Amber teething necklaces? I leave for a week and when I come back, I realize your kid went from baby to toddler! I mean, seriously? he looks grown up! he even has teeth! That’s not fair! It’s happening so fast! (he is cute as hell, though). What book are you writing?! Can’t wait to hear what you have to say, seriously! @ April – Yup, the info is always changing which is why, again, I say go with your gut! All the research conflicts regarding allergens, introductions, delays . . . you can drive yourself crazy trying to get it all straight. Yeesh. @ erosan – Hi!! I was just thinking about you yesterday and planning on sending you an email to check in. How’s life with new baby??? I bet you’re in heaven. Yay! I’m raising a non vegan/veggie baby but the same rules apply. We skipped baby rice stage too and, as I cook meals from scratch, my little one eats pretty much what we do. Often I’ll adapt dishes and freeze down portions. And as processed food for babies is very expensive for babies here (here being Switzerland), it an added incentive to feed home cooked food. What a great idea to do a series on this! my little one is almost 2 & a half so I would like to offer some retrospective advice. The book ‘my child won’t eat’ (available on amazon) is fantastic! I read it when I thought that this was a problem, when she was about 10 mths old I think, but I wish I had read it before we introduced solids (at 6 mths). It is a real eye-opener about the attitudes people have to food and how we convey these unhealthy attitudes to our children. I battled with weight issues my whole life and have only recently been able to take ownership of my body and nutrition in a real way, and I believe it is because of the journey I have gone through with my child. I’m still battling my emotional attachments to food, but I’m on the right track. For my daughter I want her to learn right from the beginning that food is neutral. We do not praise her for finishing her food, or scold for only eating one bite. How much she eats should be dictated by nothing but the appetite of her healthy little body! This can be a hard lesson for parents who want to nourish their children, but I believe getting right in the beginning can have a huge impact on the rest of their lives. long comment, sorry :) but I feel pretty darn strongly on the subject! Sayward, thanks for the advice. I will head to the health food store to inquire TODAY! Thanks so much for posting this. I have a 1 year old and I am desperately trying to figure out a way to transition my daughter to a more humane diet. I look forward to reading more about this from you. i really enjoyed your galadarling interview and that’s how i found you here. hubby and i are new parents and are definitely hoping that our parenting will flow naturally from our consciousness. your blog is definitely helping thus far! our sweet pea is only 2 and a half months but i will enjoy gleaning some ideas from you. blessings! This post came at the perfect time. I’ve been stressing out trying to feed my vegetarian toddler a healthy variety of food. We don’t eat dairy products, so I love reading vegan recipes… but we do eat some fish and eggs so we can’t call ourselves vegan. He’s at the stage where he prefers finger foods instead of being spoon-fed by me. I end up feeding him processed cereal for snacks because it’s so easy, but I want to move away from that and toward more whole foods. He loves all fruits and some veggies (avocados and tomatoes), but I can’t get him to eat things like spinach or green beans in any form! Do you take probiotic supplements, or do you try to get all of your probiotics in food? I wanted to let you know that I appreciate your alt milk article because I’m afraid I’ve been giving my son too much soy milk. I’m going to try making my own almond milk this week. I can’t wait to read the rest of this series! WAITS HAS TEETH!!! How do they grow so fast?! @ Charlotte – We do the same thing! I simplified version of what we’re eating, sans salt of course. @ natashia – Thanks for the book rec, I’ll totally check that out. I do worry about that, especially because I’m so into food and nutrition. I don’t want to give him a complex! It’s such a difficult balance to strike though . . . like so many things in parenting. @ Rea – Awesome! I wasn’t even thinking along the lines of fiction, but duh – of course! Is the reason for no cereal because it’s processed/not whole? Or too full of carbs? @Natashia, that book sounds great – but it’s $120 or so on amazon.com and not available on amazon.ca. Alas, sounds really great – I’ll keep an eye out as it sounds interesting (and b/c I often get frustrated at meal times). Abby – I am shocked at the price! It’s a little +- 150 pg paperback! I can’t help but wonder if they haven’t made a HUGE mistake! My next best suggestion is to contact your local chapter of La Leche League (www.llli.org) and see if you can’t get a copy via them. I think the effort would be well worth it, I can’t recommend this book highly enough! @ Darciefaro – A couple of reasons! Firstly, because cereals have very little nutrients, relatively speaking – especially the ones targeted at babies. Other than iron, rice cereal is basically empty calories. So they fill the belly but offer little in the way of nutrients. I’d rather fill the belly with breast milk!